Proprietary Name: Hydrocortisone Valerate What is the Proprietary Name? Non-Proprietary Name: Hydrocortisone Valerate What is the Non-Proprietary Name? Hydrocortisone Valerate with NDC 68462-836 is a a human prescription drug product labeled by Glenmark Pharmaceuticals Inc., Usa. The generic name of Hydrocortisone Valerate is hydrocortisone valerate. The product's dosage form is ointment and is administered via topical form. FDA Application Number: ANDA211750 What is the FDA Application Number? Rx onlyFor Dermatologic Use Only. Not for Ophthalmic Use. 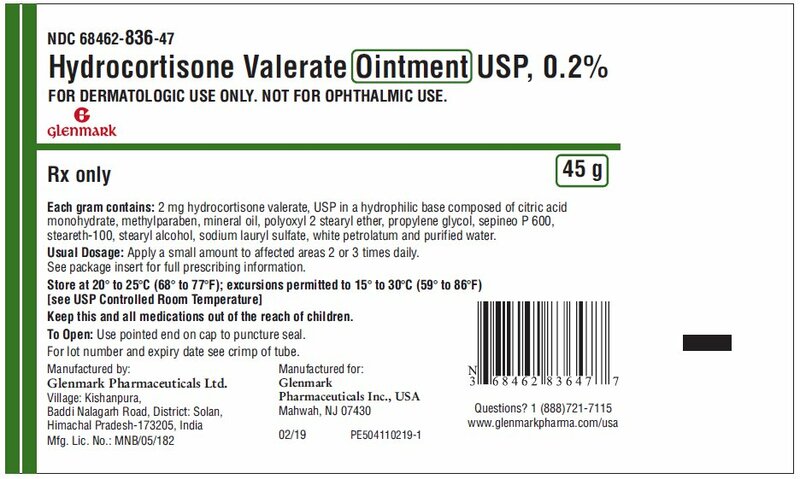 Hydrocortisone Valerate Ointment USP, 0.2% contains hydrocortisone valerate, USP, pregn-4-ene-3,20-dione, 11,21-dihydroxy-17-[(1-oxopentyl)oxy]-, (11β)-;cortisol 17-valerate or 11β,17,21-Trihydroxypregn-4-ene-3,20-dione 17-valerate, a synthetic corticosteroid for topical dermatologic use. 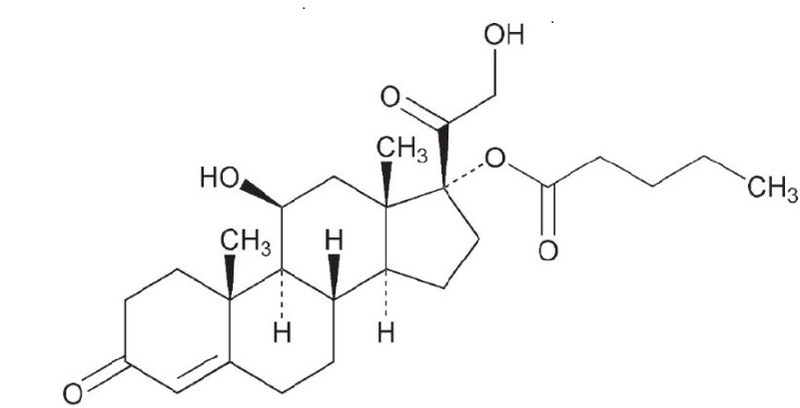 The corticosteroids constitute a class of primarily synthetic steroids used topically as anti-inflammatory and antipruritic agents.Chemically, hydrocortisone valerate, USP is C26H38O6. It has the following structural formula:Hydrocortisone valerate, USP has a molecular weight of 446.58. It is a white or almost white crystalline powder, freely soluble in acetone and dichloromethane; soluble in alcohol; insoluble in water.Each gram of Hydrocortisone Valerate Ointment, USP, 0.2% contains 2 mg hydrocortisone valerate, USP in a hydrophilic base composed of citric acid monohydrate, methyl paraben, mineral oil, polyoxyl stearyl ether, propylene glycol, sepineo P 600, steareth 100, stearyl alcohol, sodium lauryl sulfate, white petrolatum and purified water. The extent of percutaneous absorption of topical corticosteroids is determined by many factors including the vehicle and the integrity of the epidermal barrier. Occlusive dressings with hydrocortisone for up to 24 hours have not been demonstrated to increase penetration; however, occlusion of hydrocortisone for 96 hours markedly enhances penetration. Topical corticosteroids can be absorbed from normal intact skin. Inflammation and/or other disease processes in the skin may increase percutaneous absorption.Studies performed with hydrocortisone valerate ointment, 0.2% indicate that it is in the medium range of potency as compared with other topical corticosteroids. 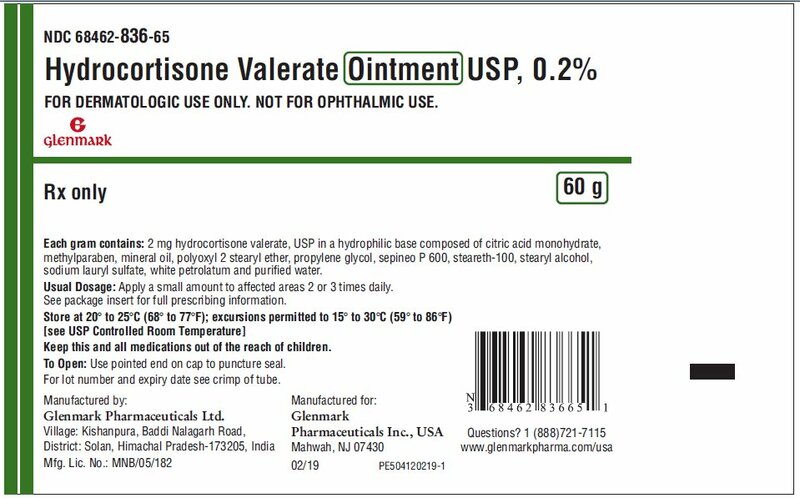 Hydrocortisone valerate ointment, 0.2% is a medium potency corticosteroid indicated for the relief of the inflammatory and pruritic manifestations of corticosteroid responsive dermatoses in adult patients. 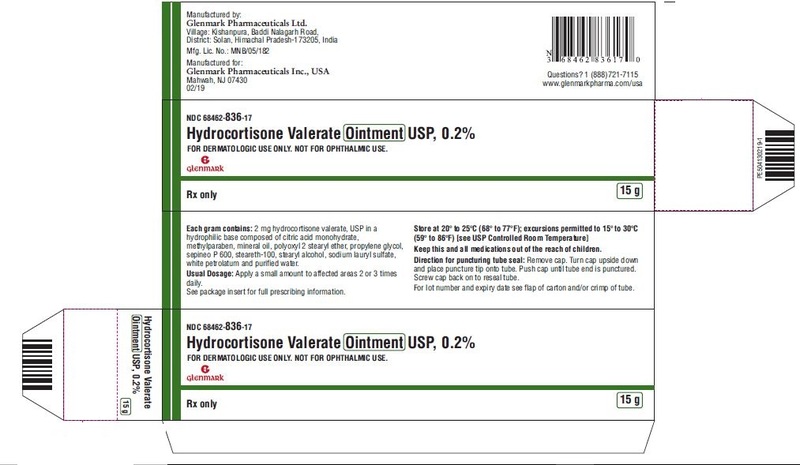 Hydrocortisone valerate ointment, 0.2% is contraindicated in those patients with a history of hypersensitivity to any of the components of the preparation. Systemic absorption of topical corticosteroids can produce reversible hypothalamic-pituitary-adrenal (HPA) axis suppression with the potential for glucocorticosteroid insufficiency after withdrawal of treatment. Manifestations of Cushing's syndrome, hyperglycemia, and glucosuria can also be produced in some patients by systemic absorption of topical corticosteroids while on treatment.Patients applying a topical steroid to a large surface area or to areas under occlusion should be evaluated periodically for evidence of HPA axis suppression. This may be done by using the ACTH stimulation, A.M. plasma cortisol, and urinary free cortisol tests.Hydrocortisone valerate ointment, 0.2% has produced mild, reversible adrenal suppression in adult patients when used under occlusion for 5 days, 15 grams twice a day over 25 to 60% body surface area or when used three times a day over 20 to 30% body surface area to treat psoriasis for 3 to 4 weeks.If HPA axis suppression is noted, an attempt should be made to withdraw the drug, to reduce the frequency of application, or to substitute a less potent corticosteroid. Recovery of HPA axis function is generally prompt upon discontinuation of topical corticosteroids. Infrequently, signs and symptoms of glucocorticosteroid insufficiency may occur, requiring supplemental systemic corticosteroids. For information on systemic supplementation, see prescribing information for these products.Pediatric patients may be more susceptible to systemic toxicity from equivalent doses due to their larger skin surface to body mass ratios. 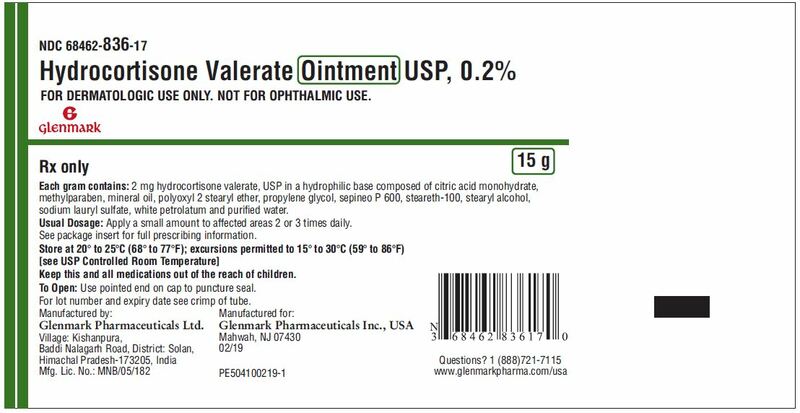 (See PRECAUTIONS -- Pediatric Use).If irritation develops, hydrocortisone valerate ointment, 0.2% should be discontinued and appropriate therapy instituted. Allergic contact dermatitis with corticosteroids is usually diagnosed by observing a failure to heal rather than noting a clinical exacerbation, as with most topical products not containing corticosteroids. Such an observation should be corroborated with appropriate diagnostic patch testing.If concomitant skin infections are present or develop, an appropriate antifungal or antibacterial agent should be used. If a favorable response does not occur promptly, use of hydrocortisone valerate ointment, 0.2% should be discontinued until the infection has been adequately controlled. Patients using topical corticosteroids should receive the following information and instructions:1.This medication is to be used as directed by the physician. It is for external use only. Avoid contact with the eyes.2.This medication should not be used for any disorder other than that for which it was prescribed.3.The treated skin area should not be bandaged, otherwise covered or wrapped, so as to be occlusive unless directed by the physician.4.Patients should report to their physician any signs of local adverse reactions.5.Hydrocortisone valerate ointment, 0.2% should not be applied in the diaper areas as diapers or plastic pants may constitute occlusive dressings. (See DOSAGE AND ADMINISTRATION. )6.This medication should not be used on the face, underarms, or groin areas unless directed by the physician.7.As with other corticosteroids, therapy should be discontinued when control is achieved. If no improvement is seen within 2 weeks, contact the physician. Long-term animal studies have not been performed to evaluate the carcinogenic potential of hydrocortisone valerate. Hydrocortisone valerate ointment, 0.2% was shown to be non-mutagenic in the Ames-Salmonella/Microsome Plate Test. There are no studies which assess the effects of hydrocortisone valerate on fertility and general reproductive performance. Corticosteroids have been shown to be teratogenic in laboratory animals when administered systemically at relatively low dosage levels. Some corticosteroids have been shown to be teratogenic after dermal application in laboratory animals.Dermal embryofetal developmental studies were conducted in rabbits and rats with hydrocortisone valerate cream, 0.2%. Hydrocortisone valerate cream, 0.2%, was administered topically for 4 hours/day, rather than the preferred 24 hours/day, during the period of organogenesis in rats (gestational days 5 to 16) and rabbits (gestational days 6 to 19). Topical doses of hydrocortisone valerate up to 9 mg/kg/day (54 mg/m2/day) were administered to rats and 5 mg/kg/day (60 mg/m2/day) were administered to rabbits. In the absence of maternal toxicity, a significant increase in delayed skeletal ossification in fetuses was noted at 9 mg/kg/day [2.5X the Maximum Recommended Human Dose (MRHD) based on body surface area (BSA) comparisons] in the rat study. No malformations in the fetuses were noted at 9 mg/kg/day (2.5X MRHD based on BSA comparisons) in the rat study. Indicators of embryofetal toxicity, significant decrease in fetal weight at 2 mg/kg/day (1X MRHD based on BSA) and a significant increase in post-implantation loss and embryo resorption at 5 mg/kg (3X MRHD based on BSA), were noted in the rabbit study. A significant increase in delayed skeletal ossification in fetuses was noted at 5 mg/kg/day (3× the MRHD based on BSA comparisons) in the rabbit study. Increased numbers of fetal malformations (e.g., cleft palate, omphalocele and clubbed feet) were noted at 5 mg/kg/day (3X MRHD based on BSA comparisons) in the rabbit study.There are no adequate and well-controlled studies in pregnant women. Hydrocortisone valerate ointment, 0.2% should be used during pregnancy only if the potential benefit justifies the potential risk to the fetus. Systemically administered corticosteroids appear in human milk and could suppress growth, interfere with endogenous corticosteroid production, or cause other untoward effects. It is not known whether topical administration of corticosteroids could result in sufficient systemic absorption to produce detectable quantities in human milk. Because many drugs are excreted in human milk, caution should be exercised when hydrocortisone valerate ointment, 0.2% is administered to a nursing woman. Safety of this product in pediatric patients has not been established. There is no data on adrenal suppression and/or growth suppression.Because of a higher ratio of skin surface area to body mass, pediatric patients are at a greater risk than adults of HPA axis suppression and Cushing's syndrome when they are treated with topical corticosteroids. They are therefore also at a greater risk of adrenal insufficiency during and/or after withdrawal of treatment. Adverse effects including striae have been reported with inappropriate use of topical corticosteroids in infants and children. (See PRECAUTIONS)HPA axis suppression, Cushing's syndrome, linear growth retardation, delayed weight gain, and intracranial hypertension have been reported in children receiving topical corticosteroids. Manifestations of adrenal suppression in children include low plasma cortisol levels, and an absence of response to ACTH stimulation. Manifestations of intracranial hypertension include bulging fontanelles, headaches, and bilateral papilledema. Clinical studies of hydrocortisone valerate ointment, 0.2% did not include sufficient numbers of subjects aged 65 and over to determine whether they respond differently from younger subjects. Other reported clinical experience has not identified differences in responses between the elderly and younger patients. Topically applied hydrocortisone valerate ointment, 0.2% can be absorbed in sufficient amounts to produce systemic effects (see PRECAUTIONS). 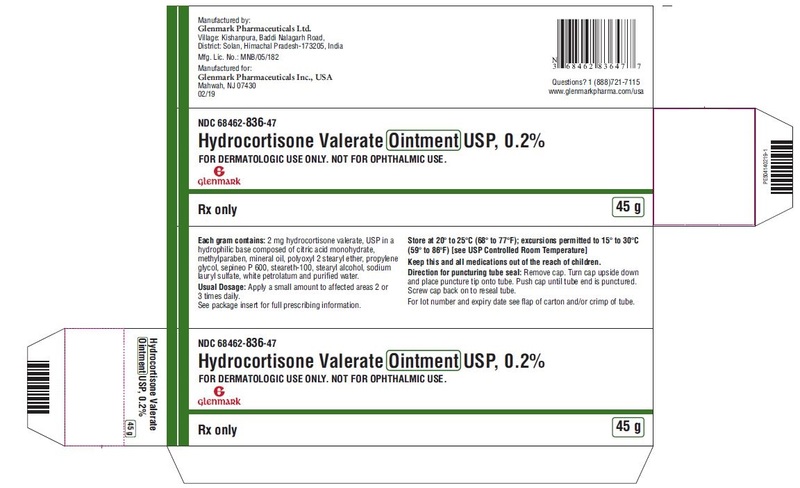 Hydrocortisone valerate ointment, 0.2% should be applied to the affected area as a thin film two or three times daily depending on the severity of the condition.As with other corticosteroids, therapy should be discontinued when control is achieved. If no improvement is seen within 2 weeks, reassessment of the diagnosis may be necessary.Hydrocortisone valerate ointment, 0.2% should not be used with occlusive dressings unless directed by a physician. Hydrocortisone valerate ointment, 0.2% should not be applied in the diaper area if the patient requires diapers or plastic pants as these garments may constitute occlusive dressing. 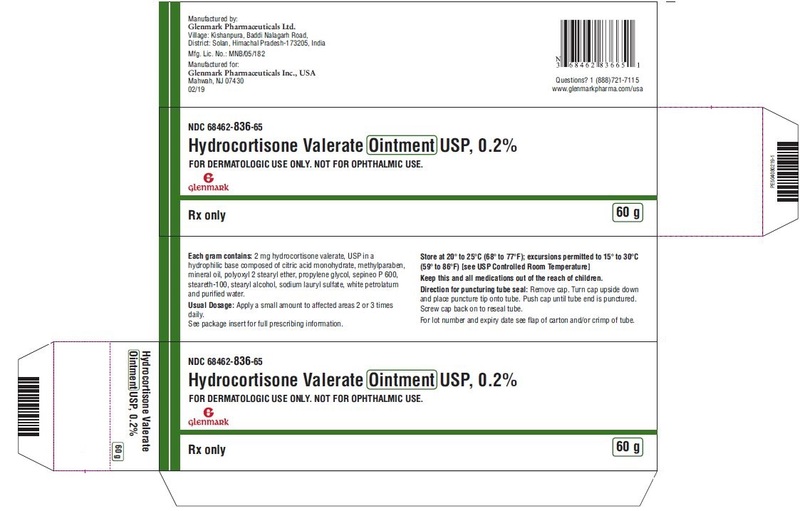 Hydrocortisone Valerate Ointment USP, 0.2% is supplied in the following tube sizes:15 g – NDC 68462-836-1745 g – NDC 68462-836-4760 g – NDC 68462-836-65Store at 20° to 25°C (68° to 77°F); excursions permitted to 15° to 30°C (59° to 86°F) [see USP Controlled Room Temperature].